To accomplish His plan and purpose. A recent article on Inc.com titled “Amazon Almost Killed Best Buy. Then, Best Buy Did Something Completely Brilliant” by Justin Bariso, tells a remarkable story of how this corporate giant almost died and came back to life. The year was 2012, and everything seemed to be going wrong for Best Buy. The CEO had just resigned after admitting to an improper relationship with a female employee. Employee engagement seemed to be at an all-time low. And Best Buy stores were bleeding money--as customers came to test products they wanted, only to buy them online from Amazon at a cheaper price. Best Buy was dying a slow death. But fast forward to today, and the company is thriving. The stock price is surging, and workers seem happier than ever. So, how did Best Buy do it? Hubert Joly, the new CEO, focused on people and practiced humility. In his first months on the job, Joly did something great. He visited Best Buy stores (and even worked at a store for a week), giving him the chance to speak directly to front line employees. Based on their feedback, Joly did 3 things. He fixed broken systems, he restored a beloved employee discount program, and he invested in employee training. The measures appear to have worked. A survey showed 78 percent of employees would recommend working at Best Buy to a friend, and Joly enjoys a 92 percent employee approval rate. The point is simple. In the end, Best Buy discovered that their success depends on the people inside their organization first, before anyone on the outside walks through their doors. Likewise, the success of the Church in fulfilling its mission for God depends first on the people inside (that’s you and me) if we are going to reach those on the outside. God uses His people to accomplish His work. That is why our Freedom Campaign is so important. And that is why I am asking you to pray and participate in this God honoring endeavor to get free of the financial encumbrances that we have in order to be free to be all, and even more, that God desires of us. In just a few weeks we will make commitments for the next 3 years above and beyond our regular tithes and offerings. I trust that you will and are, asking God to make known to you, as Alison and I are doing, what kind of sacrificial gift you will make. Don’t ask, “God, what can I manage,” ask instead, “God, what amount do you want me to give?” I’ll talk a bit this morning about how God provides supernaturally for what He prompts in our lives. I shared God’s Vision for our church last week and I shared some incredible statistics about what God has done through this congregation over the last, almost, two decades. Our Freedom Campaign will help position us for the days ahead and the great things that God will do in our lives today and then, in our kids, grandkids, and those yet to come in our tomorrows. Thank you in advance for your commitment to the Kingdom of God at work through Ridgecrest. May God be pleased with each of us as we walk by faith and see the unseen as if it were seen! And remember, God is always trying to take us someplace new. I love being your Pastor!!! Pastor Ray Jones came to Ridgecrest Baptist Church in February 2001. Prior to his call to Ridgecrest, he headed the Personal Evangelism Division for the North American Mission Board (NAMB) of the Southern Baptist Convention. While there, Ray and his team were involved in the development of a national evangelism strategy entitled "THE NET" which is currently being used in more than 6,000 churches nationwide. Before leaving NAMB, he served as pastor of the Fifth Avenue Baptist Church in St. Petersburg, FL for three years. During that time attendance grew from 150 to a membership of more than 1100. 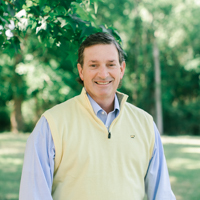 He attended Samford University in Birmingham and is a graduate of Dallas Baptist University. He also did graduate work at New Orleans Baptist Theological Seminary. Ray is originally from Birmingham, AL. God is using him in incredible ways as he shepherds and leads the family here at Ridgecrest.